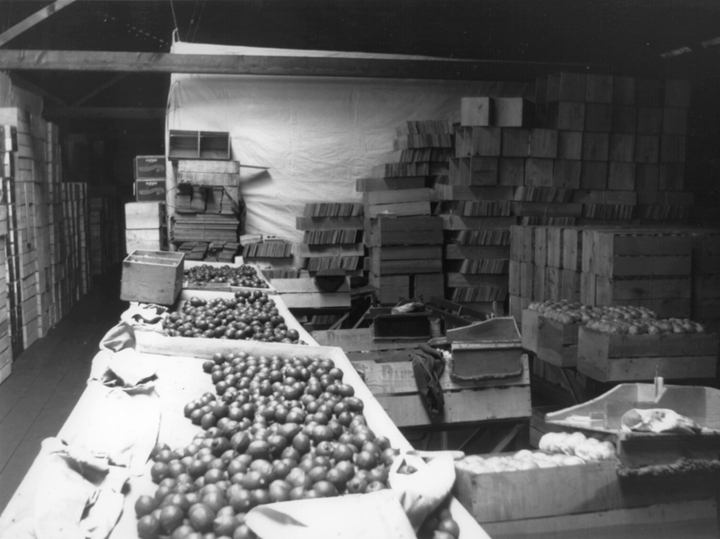 In the early 1890s, Lemon Grove’s fledgling citrus industry, known in 1893 as the Lemon Growers Association, consisted of a lone packing house shown in this rare interior image. 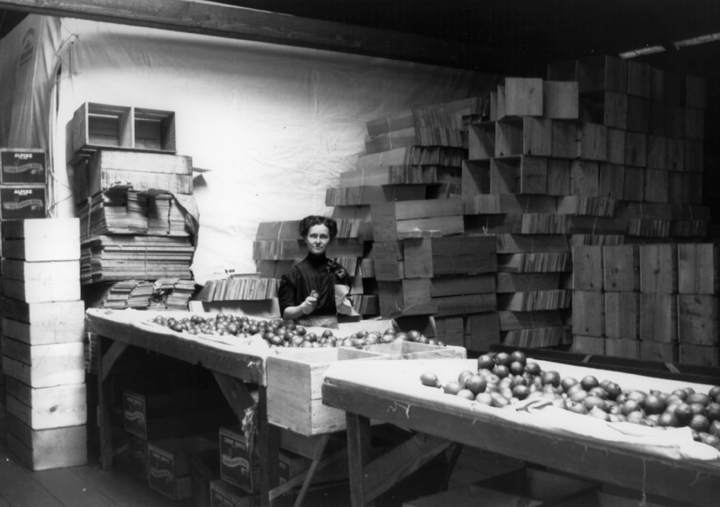 An unknown woman (possibly the wife of a local grower) works amid sheet-draped walls and sorting table to keep down dust as she wipes and grades lemons by size and packs them in wooden boxes assembled from the parts stacked floor-to-ceiling behind her. Oh, to know the name of this woman who symbolized the blockbuster industry to come! This related image shows a workman in another part of the lone packing house, circa 1893. He holds either a label or a work order in one hand and a box assembly tool in the other. 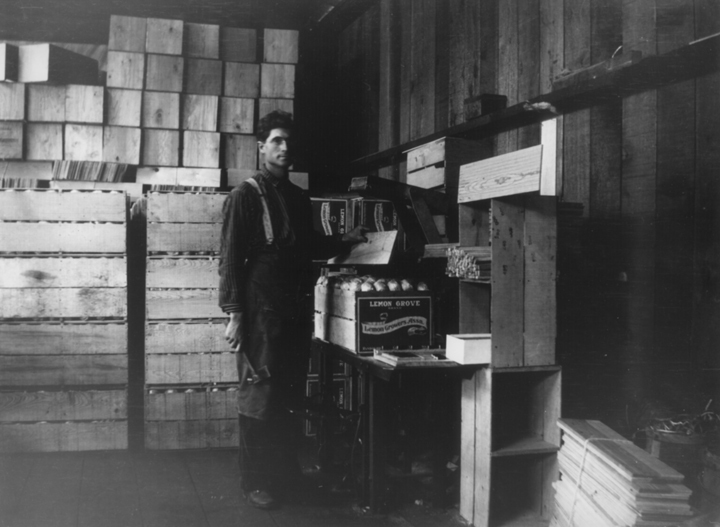 He hammered boxes together and affixed a “lug label” to the end of each, proclaiming “Lemon Growers Association.” Seen behind him are stacks of fruit-filled boxes. Once the top is tacked in place, the box is ready to be moved onto the loading dock by the train tracks and into box cars headed to the Midwest and East. This image hints at the tons of fruit and thousands of crates needed to prepare local crops for their train journeys across the nation. Note the sloping work tables with raised edging to keep fruit from tumbling off during sorting. 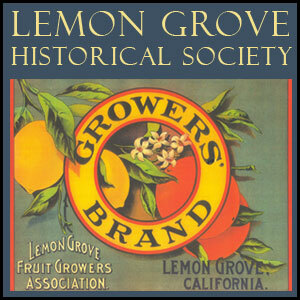 The 1893 Lemon Growers Association was the precursor to the growers’ cooperative Lemon Grove Fruit Growers Association, a powerhouse organization formed in 1908 to market its millions of tons of award-winning fruit. Its fruit labels, like the one shown on our home page, became a treasured art form, examples of superb graphic design and the lithographer’s art. The Lemon Grove Historical Society grew up with the City it serves and is its leading cultural organization. Lemon Grove was incorporated as California’s 414th city in 1977. Its historical society, active informally for many years, was established in 1978 as a 501(c)(3) non profit corporation. LGHS is governed by a seven-member board with rotating museum docents and various committee chairs, and is a membership organization open to ages eight and over. The society’s mission is to research, preserve and share the history of Lemon Grove in a regional/state/national context, promote interest in the arts and humanities, especially historical studies, and operate sites and public programs that advance these goals. LGHS is active in the Lemon Grove School District and in many City projects designed to beautify and distinguish the community. LGHS saved the City’s first church, the 1897 First Congregational Church of Christ (also known as the Atherton Chapel”) and oversaw its adaptive reuse as the Parsonage Museum of Lemon Grove. This Folk Victorian charmer offers two floors of beautiful exhibits related to the civic story. The society further saved the 1928 H. Lee House, a handsome Tudor Revival mansion, and oversaw its adaptive reuse as the City’s cultural center and as a popular site for social rentals.